Take a trip out to Nikko and create your own adventure with this 4-day pass. Take advantage of discounts and unlimited rides on buses and trains to visit famous shrines and temples, the Kinugawa Onsen hot springs, and sites of natural beauty like the Kirifuri no Taki waterfall. One round trip from Asakusa to Shimoimaichi station, and the unlimited train and bus ride zones in the map are included. 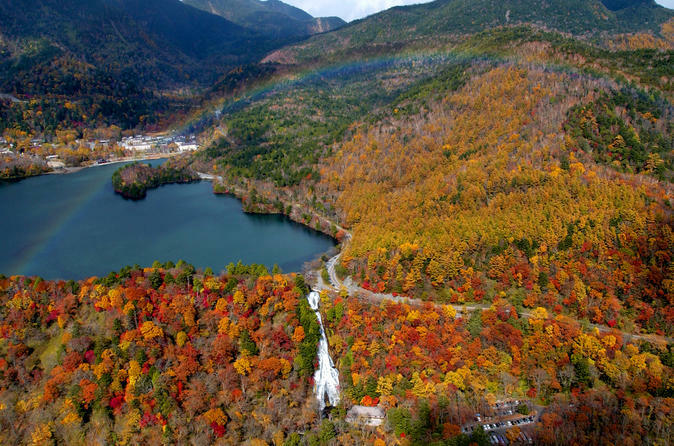 For travelers who would like to enjoy Nikko area more cheaper, more quicker, please see Nikko City Area Pass also. Pick up your train ticket at Tourist Information Center Asakusa where located in Tobu Asakusa St. It takes only 1 hours and 50 min approx. from Asakusa to Nikko and 2 hours and 10 min approx. from Asakusa to Kinugawa Onsen with limited express. Famous for its many UNESCO-listed shrines and temples, Nikko promises a look into history and culture surrounded by natural, mountainous beauty. For a bit of relaxation, head to nearby Kinugawa Onsen, a hot springs town where you can destress. Also indulge in retail therapy with discounts at stores and restaurants around Nikko and Kinugawa. Make time to visit Kirifri no Taki, an incredible 246-foot (75-m) waterfall that has inspired artists throughout the ages, including Katsushika Hokusai. The waterfall is surrounded by lush trees whose foliage changes color every season, making each visit vibrant and unique. Explore all of Nikko's natural beauty, which encompasses waterfalls, lakes, and hiking trails, during your 4-day journey.